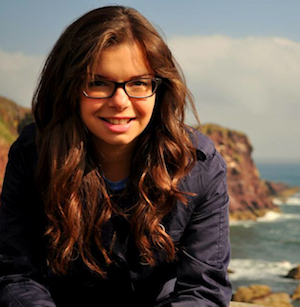 When I started at Edinburgh Napier University in 2013, I entered the course as a composer. This was the principal study throughout my first and second year, which I attended weekly classes in and learnt vast amounts over the two-year period about compositional techniques, receiving expert advice from my tutors on a one-to-one level. At the beginning of my third year I decided to drop composition in order to give more focus to other areas of music, such as business, teaching, performance, world music, community music and music therapy. 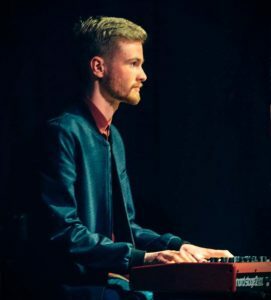 I have thoroughly enjoyed broadening my selection of modules and, as a result, I have not only been provided with opportunities to pick up new instruments (I started playing the bass for a Jazz module and consequently took part in the Jazz Summer School this year), but also realised what route I may like to take as a potential career path. I am particularly interested in community music, and I hope to focus on this for my Major Music Project this year. I was lucky enough to observe and take part in a few sessions at Drake Music Scotland recently, which confirmed my passion for this type of work. This was an opportunity, along with many others over the last three years, that I would not have been presented with had I not come to study at Napier and met the contacts I have in the music department here. Beginning my studies in 2013, I am now in my final year of the Popular Music course at Edinburgh Napier University. Over the last few years I have met a fantastic array of people and learnt an invaluable amount about my craft and the music industries. With the support and expertise of my lecturers I have experienced a variety of subjects such as performance, business, teaching, world music, and film/TV music composition, allowing me to explore multiple strands of a musical career. I have also developed as a vocalist, singing in a diverse range of musical styles and strengthening skills in stagecraft and arrangement. I have greatly appreciated the course’s emphasis on practical application and discipline whilst still maintaining a strong academic underpinning. I have been presented with various opportunities to perform within the university, including playing my original songs as part of Napier’s Degree Show and at the Student & Alumni Achievement Awards. I was also able to form a band with fellow course mates, gigging frequently around Edinburgh and Glasgow; this experience of networking helped me meet new contacts, leading to performances at T in the Park, Belladrum and the BBC’s Quay Sessions with local band Mt. Doubt. In addition I have staged gigs for up-and-coming bands in the city as a founding member of promotions group Electric Red Events. Moving to Edinburgh to study at Napier is a decision I am extremely grateful to have made, with the course increasing my network, heightening my musicianship and displaying exciting opportunities for the future. I am an Edinburgh/Glasgow based Drummer/Percussionist studying on the Popular Music course at Edinburgh Napier University. 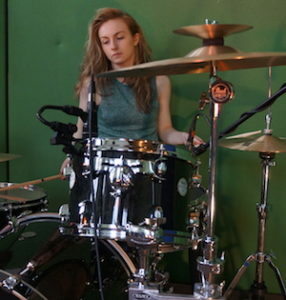 Currently I have just progressed into 2nd year and during my first year I learned so many new skills that expanded my love and knowledge for drums. 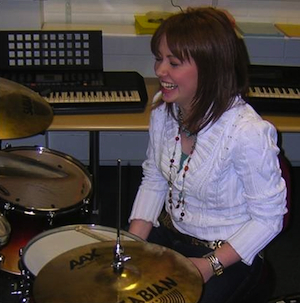 I picked up drums when I was 11 and have been largely self-taught until enrolling at Edinburgh Napier. To broaden my musical abilities, I studied Percussion and Piano and The Royal Conservatoire of Scotland during my last 2 years of high school. I participated in many orchestras and ensembles throughout my time there. I currently play for a number of artists and bands such as singer/songwriters Robbie Hutton and Ruth Gillies. 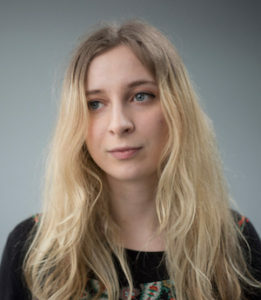 In addition, I also play for the National Youth Jazz Orchestra (Access) who I toured with during the summer playing sold out concerts in Sabhal Mor Ostaig as part of Skye’s Music Festival and at Glasgow’s Royal Concert Hall. Edinburgh Napier has already taught me so much and helped me to pursue my role as a session musician outside of University. The incredible facilities really make the University experience really enjoyable. There are so many opportunities at Edinburgh Napier University, both as part of your course and extra-curricular to develop various aspects of your musicianship. From Vocal Class, where you learn alongside fellow singers throughout the Music School, to more independent experiences of creating and working in a student-run ensemble, there is always a chance to grow and establish yourself as a musician. The focus on character work, stage deportment, musicianship and self-assurance has been invaluable. Since studying at Napier I’ve discovered how much I enjoy choral and ensemble performance; from that I’ve been able to perform regularly not only with the Edinburgh Napier Chamber Choir but with a variety of church choirs, the SCO chorus, SVE singers and Vox Coelestis. Edinburgh Napier also helps to bring out your skills in other instruments or fields of music; I’ve been able to work, and have great fun, as part of a Percussion Ensemble during my time, as well as having the opportunity to work on my conducting with the Chamber Choir during one of their Carol Services. I’m thrilled that I made the decision to come to such a vibrant University in such a thriving city. Studying at Edinburgh Napier University has been a great experience for me. Coming to Scotland from a different country means you have to do your best and look for opportunities. 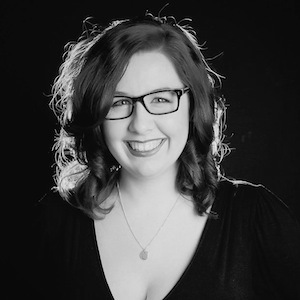 As a vocalist and flautist I had chances to get involved in various music projects including playing with the Tinderbox Orchestra, voice tutoring for the Scottish Chamber Orchestra VIBE Project and also performing with the Edinburgh Napier Chamber Choir. The diversity of the curriculum – voice teaching, arranging, theory, community music, business and many more to come – has broadened my horizons as a musician. 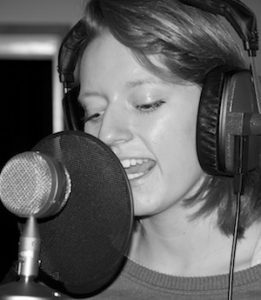 I feel I have matured as a vocalist thanks to the support of teachers and the opportunity of singing in different music styles from pop/rock through musical theatre to jazz/fusion. Good networking between students and staff members has been fruitful for me as I am a voice/music theory/flute and piano teacher for Most Entertaining, an Edinburgh-based music tuition company and a vocalist in Banana Row Studios’ function bands. Another valuable experience was performing in various venues as a singer in a jazz duo. Being part of the music community at Edinburgh Napier is a wonderful experience – coming here was one of the best decisions I ever made! 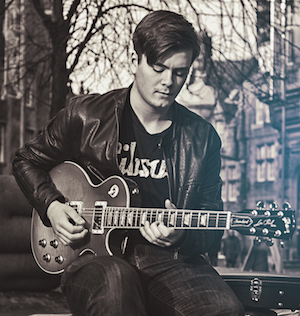 In the first two years of my studies I have learnt a vast array of valuable skills as a musician that I know I could not have learnt without the help of the lecturers here at Edinburgh Napier. I love to perform and will be carrying on with instrument and performance ensemble studies in 3rd and 4th year. Studying my instrument at an academic level has made me push myself to practice music far more than I ever would have had I not come to University. The knowledge and skills I have gained whilst at Napier have opened up many doors for me; I now have a clearer idea of the various ways in which I can potentially make a living from doing what I love. Since moving to Edinburgh and starting at Edinburgh Napier I have had several opportunities to gig around the city with my course mates. The fact that the rehearsal facilities are open 24/7 gives us the freedom to organise practice and recording sessions at any time of day. The best thing about studying here for me is that we are encouraged to work with each other – everyone has something different to offer and you can learn so much from simply jamming with your peers. Coming from a different country to study at Napier University has been an exciting and fulfilling experience for me so far. My three years of study have presented me with countless opportunities to put into practice and expand on what I have learned from the course. The BMus (Hons) course at Napier strikes the perfect balance between the practical and academic aspects of music, with great facilities and resources on campus supporting both in an extremely helpful and supportive environment. 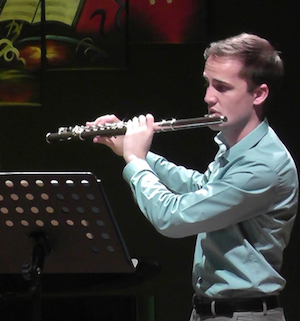 I have been lucky enough to perform with the Edinburgh Napier Chamber Orchestra, Chamber choir, Flute Ensemble (run by us students), Contemporary Ensemble and in various other projects and workshops organised by staff and students alike. I have also had the chance to take part in numerous workshops and masterclasses organised for the wind department. These include sessions with Katherine Bryan, Sarah Newbold, Pete Furniss, Roger Foxwell and some very helpful yoga sessions with our flute teacher Andrea Kuypers! 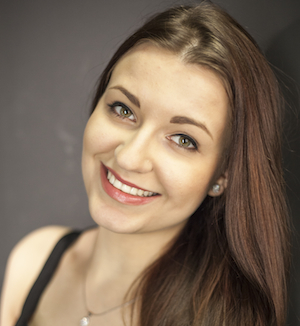 The course has also allowed me to develop aspects essential to a musical career such as instrumental teaching, self-promoting and taking on organizational roles such as being secretary to the Orchestral Society’s student committee. For the first term of my third year at Napier, I decided to take a leap and study at the Tampere University of Applied Sciences (TAMK) in Finland. It was my flute teacher, Andrea Kuypers, who first gave me the idea of going away because she thought I would really take advantage of it and enjoy my time there. And she was completely right! It opened my eyes to the possibilities out there because, on our island, we don’t find out a lot that’s happening offshore. The University is a very practical one and a lot of the courses offered focus on what you’ll be doing in your future. I played in many different ensembles there and took full advantage of the amazing music scene, both in Tampere and Helsinki. And of course, all the new friends I now have will stay with me for a long time yet. Now that I’m back in Scotland, a lot of people have asked me “why Finland?” and the reason for that is that the music department at Napier already has connections with TAMK. Also, Finland is a beautiful country, stuffed to the brim with culture. 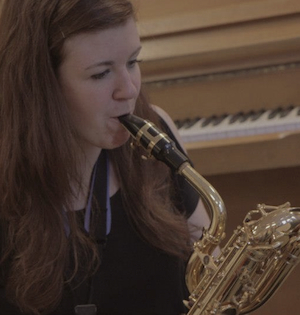 As a saxophonist I have been given many opportunities through my studies at Edinburgh Napier to develop (such as through performing solo with orchestra, in theatre productions and gaining experience in smaller ensembles playing new music with the contemporary music ensemble), but I feel that it is equally important that Napier provided me with a broader musical education. I am currently involved in not only university ensembles on my main instrument, but have also recently discovered a love for singing during my time on the course. I perform regularly with the Scottish Chamber Orchestra as a Chorus member, and sing in services with the choir of St Andrews and St Georges West and The Robin Chapel. I hope to pursue a career in saxophone performance and begin postgraduate study after I graduate, though I will not stop singing! Working under the name CoriAnder, I am an electronic music producer, composer and DJ. I have written and co-written over 70 songs, produced and remixed other artists’ work and released five albums and one EP. I have also been interviewed and had several of my songs played on BBC Introducing. During my third year, I was one of three music students chosen to represent the university (and Scotland) at Conservatorium Haarlem’s International Writers Camp, in the Netherlands. The week was spent collaborating with music students from around the world and culminated with each group presenting their song to a panel of industry representatives. My group’s song was one of the few selected by Sony/ATV Music Publishing to be pitched to an artist on their label. I recently accepted the post of Music Technology Lecturer on the Junior Napier Music course. My job is to teach high school students how to use industry-standard software to record, edit and mix music. And last year, along with three other Edinburgh Napier music students, I started up an event-planning company, Electric Red Events, aimed at organising and promoting gigs for students in and around Edinburgh. Edinburgh Napier’s Popular Music course has opened up so many opportunities for me and the past few years have undoubtedly been the best of my life so far. Whilst studying at Edinburgh Napier University, I have secured a job as a coordinator with Edinburgh City Council’s Youth Music Initiative project Sounds Like Friday/Saturday. I have also built up a steady number of private drum kit pupils as well as setting up my own community youth music project at Goodtrees Community Centre over the summer with the help of Napier University’s Student Grant Initiative. These achievements would not have been possible without the help and support of my tutors and peers at Edinburgh Napier University. The course is providing me with a range of skills I may apply to various sectors of the music industry as well as giving me guidance in relation to the kind of jobs and projects I would like to do when I graduate.